Avalokiteśvara or Avalokiteshvara (Sanskrit) is the bodhisattva who embodies the compassion of all Buddhas. Avalokitesvara is the most widely revered bodhisattva in Buddhism. In East Asia the bodhisattva is known as Guan Yin or Kannon (cf. Guan Yin article), both of which are female manifestations. In Tibetan Buddhism Avalokiteśvara is known as Chenrezig, and also as Padmapāni (Holder of the Lotus). In Mongolia he is Janraisag as well as Chenrezig or Chenreseg. In the Theravada tradition of Southeast Asia, Avalokiteśvara is known as Lokesvara. Tibetan Buddhism also relates Chenrezig to the foremost mantra, the six-syllable Om Mani Padme Hum. 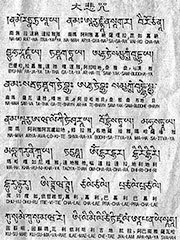 Thus Chenrezig is also called Shadakshari, «Lord of the Six Syllables». The Maha Karuna Dharani Sutra, also known as the Great Compassion Mantra, includes the 82 syllable mantra spoken by Avalokiteśvara to the assembly of Buddhas and Bodhisattvas, and extols the merits of chanting the mantra. This mantra is popular in China, Japan and Taiwan. The name Avalokiteśvara is made of four parts: the verbal prefix ava, which means «down»; the verb lok, which means «to look»; the suffix ita, which changes the verb avalok into a noun, «one who looks down»; and finally īśvara, «lord» or «master». In accordance with the rules of sound combination, ishvara becomes eshvara. Combined, the four parts mean «Lord Who Gazes Downward». The name emphasizes the bodhisattva’s primary characteristic, compassion. Western scholars have not reached a concensus on the origin of the reverence for Avalokitesvara. Some have suggested that Avalokitesvra, along with many other supernatural beings in Buddhism, was a borrowing or absorption by Mahayana Buddhism of one or more Hindu deities, in particular Shiva and Vishnu. The appellation ‘Īśvara, «lord», is sometimes used to refer to Shiva and Vishnu as well as Avalokiteshvara. Avalokitesvara itself is a Sanskrit word, supporting a common origin in cultural Hinduism. Representations of these deities may have been inspirations for some of Avalokitesvara’s depictions in art. According to Mahayana doctrine, Avalokitesvara is the bodhisattva who has made a great vow to listen to the prayers of all sentient beings in times of difficulty, and to postpone his own Buddhahood until he has assisted every being on earth in achieving nirvana. Mahayana sutras associated with Avalokitesvara include the Heart Sutra and the Lotus Sutra, particularly the 25th chapter which is sometimes referred to as the Avalokitesvara Sutra. In the Tibetan tradition, Avalokiteśvara is seen as arising from two sources. One is the relative source, where in a previous eon (kalpa) a devoted, compassionate Buddhist monk became a bodhisattva, transformed in the present kalpa into Avalokiteśvara. That is not in conflict, however, with the ultimate source, which is Avalokitesvara as the universal manifestation of compassion. The bodhisattva is viewed as the anthropomorphised vehicle for the actual deity, serving to bring about a better understanding of Avalokiteśvara to humankind. One prominent Buddhist story tells of Avalokitesvara vowing to never rest until he had freed all sentient beings from samsara. Despite strenuous effort, he realizes that still many unhappy beings were yet to be saved. After struggling to comprehend the needs of so many, his head splits into eleven pieces. Amitabha Buddha, seeing his plight, gives him eleven heads with which to hear the cries of the suffering. Upon hearing these cries and comprehending them, Avalokitesvara attempts to reach out to all those who needed aid, but found that his two arms shattered into pieces. Once more, Amitabha comes to his aid and invests him with a thousand arms with which to aid the suffering multitudes. Many Himalayan versions of the tale include eight arms with which Avalokitesvara skilfully upholds the dharma, each possessing its own particular implement, while more Chinese-specific ones give varying accounts of this number. Avalokitesvara (known as Chenrezig in Tibetan) is an important deity in Tibetan Buddhism, and is perhaps regarded as higher than a bodhisattva, specifically as a Buddha. The Dalai Lama is considered by the Gelugpa sect and many other Tibetan Buddhists to be the primary earthly manifestation of Chenrezig. Other manifestations popular in Tibet include Sahasra-bhuja (a form with a thousand arms) and Ekādaśamukha (a form with eleven faces). In Tibetan Buddhism, White Tara acts as the consort and energizer of Avalokitesvara/Chenrezig. According to popular belief, Tara came into existence from a single tear shed by Chenrezig. When the tear fell to the ground it created a lake, and a lotus opening in the lake revealed Tara. In another version, Tara emerges from the heart of Chenrezig. In either version it is Chenrezig’s outpouring of compassion which manifests Tara as a being.